« Back To The Future: What’s Next? I started HIST 291 with the perception that digital history was about bringing the past into the present using digital tools. And this is certainly a huge part of it. Tools and websites like WordPress, Audacity, Omeka, Google Earth and 3D Printing are allowing historians to share the past with a vast audience and in ways they never have been able to before. Although opportunity for historians lies within using these digital tools, there are also dangers and threats. As Daniel Cohen and Roy Rosenzweig point out in their online book, Digital History: A Guide to Gathering, Preserving, and Presenting the Past on the Web, the issue of quality is perhaps the most daunting for historians. With so much content on the web, users are not always able to distinguish between reliable and inaccurate information. What’s more, even if information is accurate, if it’s not presented in an appealing way, it won’t be read, listened to, or watched. 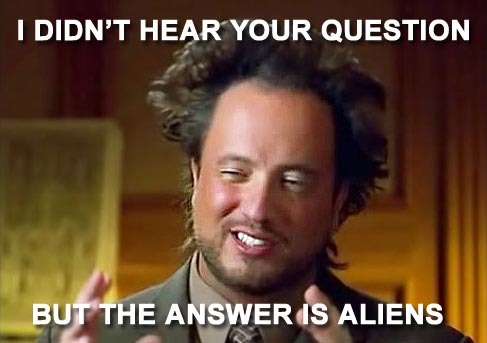 Sorry boring history sites you can’t compete with History Channel’s Ancient Aliens. You just can’t. If historians want to reach a broad audience with accurate material, they need to be aware of their content’s marketability. They have to distill it, make it accessible and sell it. This means utilizing different mediums in order to tell their stories. Digital tools are making this easier, and easier to accomplish. But in order to use these tools effectively, they must be understood by historians. Like it or not, we are living through the Third Industrial Revolution. What steam power did for the 19th century, digitization and the World Wide Web are doing for us. In this new world full of computers, digital literacy is critical, not just for historians, but for everyone who uses digital tools. This doesn’t necessarily mean historians need to know the inner workings of twitter, google or programming languages like HTML and Python. But it does mean that they need to start thinking about history’s integration with digital tools. Because separating history from technology is no longer viable in today’s world. If historians continue to think that history and technology don’t mix, the discipline is in danger of becoming irrelevant. Google’s n-gram provides a good example of this. Last week, it came to my attention that, although historians were consulted in the initial phases of the tool’s development, they were eventually dismissed because they could not contribute, or help troubleshoot the technological problems the development team was facing. And so, Google’s n-gram, a phenomenal tool for historical inquiry, was not conceived of, or built by historians. I think it begins by embracing digitization into the discipline and integrating it into our classrooms. Courses like HIST 291 and introductory programming are a great start. Perhaps even an interdisciplinary approach would be beneficial. Geographical tools like GIS are becoming more and more important in historical research. A part of this argument too, is the notion that “digital history” might be too restrictive of a term. Instead, the more encompassing “digital humanities” should be adopted. But the main objection against embracing the digital humanities, full tilt, is losing that last bit. Technology, although it has served to bring us together, has also driven us apart. Texting, facebooking and tweeting have become the primary means in which we communicate, rather than face-to-face interactions. There is a fear we are becoming socially ill-equipped and even uncomfortable around others. So the question becomes: How do we use technology to serve humanity, and not lose our humanity in the process? I think the Invisible Australians project and the Remember Me holocaust memorial, are two historical sites that strike the elusive balance between technology and people. They use digitized primary sources, images in both cases, to tell very heart wrenching, and very human stories. So what’s next for digital history and the digital humanities? I think I’ve provided some insight, but in all honesty, I don’t feel qualified to answer that question with absolute certainty. But I can answer what’s next for digital history and me. Digital history excites me. Its shown me that history can be applicable in the present and in the future. HIST 291 has opened up the proverbial “can of worms” for me in regards to my interests in history. The integration and use of digital tools within the humanities is something I intend to pursue in future courses, and hopefully, in my future career.